Please note that tickets for this event are delivered to you via e-mail in PDF format which you should print out and bring with you to convention registration. Most customers receive their PDF tickets within 3 business days of having placed their order. Please make sure to bring ALL your printed out tickets to the convention as we can not replace any tickets forgotten or lost. Convention sites generally have a business office where you can print out your tickets if you have left them home by mistake. Once you present your ticket(s) at registration or photo op areas they will be scanned for legitimacy and one-time use only. Thanks! The Chicago Comic Con is one of the largest fan conventions in the world, filled with an outrageous line-up of vendors and exhibits, attractions and surprises. Normally because of the huge attendance patrons have had to be concerned about grabbing seats in the main theatre to see the celebrities they love. Now, with The Creation Experience we're offering reserved seating in the front rows: yours come and go throughout Saturday! Go wander the immense vendors floor, grab photo ops, go get lunch, or take a break: come back to the theatre and your seat is waiting for you! No worries, no waiting, no hassles! And, great for photographers too! The international superstar we've had the pleasure of working with for 30 years! Bill is indeed a true entertainment giant whose career and life is an inspiration for us all. As Captain Kirk he created one of pop culture's most enduring characters, and he has to be the hardest working man in show business with FOUR new TV series in production for the fall including his first starring sit-com for CBS. 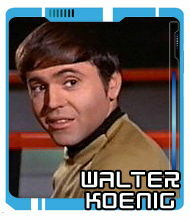 Part of the legendary cast of classic Star Trek, Walter holds a special place in the hearts of fans worldwide! 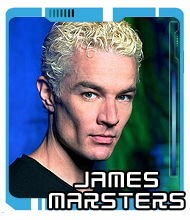 His work as Spike in the Buffy/Angel Universe created a worldwide sensation and his fans have followed him through his continuing career that includes other genre productions including SMALLVILLE, TORCHWOOD, CAPRICA, DRAGONBALL, and more! 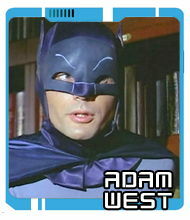 Generations of fans grew up with Adam's TV portrayal of Batman in the legendary series of the 1960's (we know we did!). Currently "seen" as Mayor Adam West on the super-hit FAMILY GUY. Join us to bring down the roof for one of the nation's most popular TV icons. 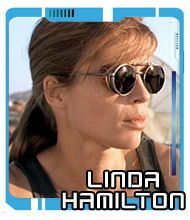 She created one of the most important female roles in movie history with her ground-breaking work as powerful Sarah Connor in the Terminator films. We also loved her on the classic CBS TV series BEAUTY AND THE BEAST. She is an amazing spirited entertainer you will definitely enjoy meeting! 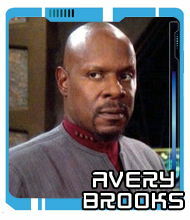 An amazing actor/performer Avery is a forceful presence on screen and stage and brought so much to Star Trek's legend and lore with his outstanding work on DS9. 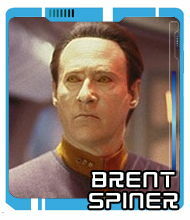 Certainly one of Star Trek's most accomplished and versatile entertainers Brent is also one of our favorites! Super-entertaining on stage and always a delight for his fans, don't miss Brent in person! Popular actor/director, John created a legendary Star Trek villian with his work as "Q"
Airing from 1966 to 1968, Batman is one of the most fondly remembered television programs of all time. 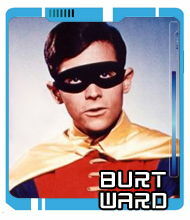 Burt's role as Robin made him a very popular TV star of the day following up the series run with several film appearances. More recently he has turned his attention to animal activism founding the Great Dane Rescue. Don't miss Burt and Adam West together in Chicago! 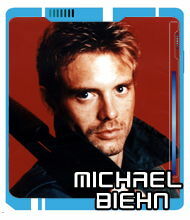 This very popular actor hit genre gold with his portrayals of Kyle Reese in THE TERMINATOR and CPL. DWAYNE HICKS in ALIENS, amongst many other roles in film and television. AUTOGRAPHS WITH ALL THE STARS: Guests will be available on the convention floor and autograph tickets can be purchased direct from them at your convenience. PHOTO OPS WITH THE STARS: See below for this opportunity to have your picture professionally shot with your favorite genre celebrity. August 4, 2010: Sir Patrick Stewart's convention representative has informed us that Sir Patrick is unable to attend this convention. Those that ordered his separate photo op or the duo photo op with William Shatner are having their money refunded via their credit cards. Please allow some time for this credit to appear on your cards. 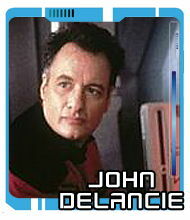 Four additional Star Trek guests Avery Brooks, Brent Spiner, Walter Koenig, and John de Lancie have been announced. Due to production scheduling conflicts, Patrick Stewart will regrettably be unable to attend Wizard World Chicago Comic Con, Aug. 19-22 at the Donald E. Stephens Convention Center in Rosemont, Ill. We are working to reschedule Mr. Stewart at a future Wizard World Comic Con. This is awesome! ON SATURDAY at the Chicago Comic Con you get a RESERVED GREAT SEAT in the main theatre where all the big stars appear (as mentioned and described above). 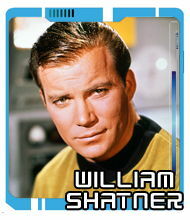 Plus, you'll also get TWO hand-signed autographed photos of Star Trek actors not appearing at this convention! You get these when you arrive at registration. EXTRA SPECIAL BONUS: There will be a separate and exclusive Registration Desk just for CREATION Experience patrons so you don't have to wait on what is sure to be huge lines to get into this monumental show! WHEN YOU ARRIVE AT THE CONVENTION BRING BOTH YOUR WIZARD TICKET AND YOUR CREATION EXPERIENCE UPGRADE TO OUR SPECIAL REGISTRATION WINDOW AND YOU'LL BE ALL SET FOR A FANTASTIC DAY FILLED WITH CELEBRITIES, EVENTS AND VENDORS. NOTE: AUTOGRAPHS AT THIS EVENT ARE SOLD DIRECTLY AT THE SHOW BY THE PERFORMERS' REPRESENTATIVES AT THEIR BOOTHS ON THE CONVENTION FLOOR. 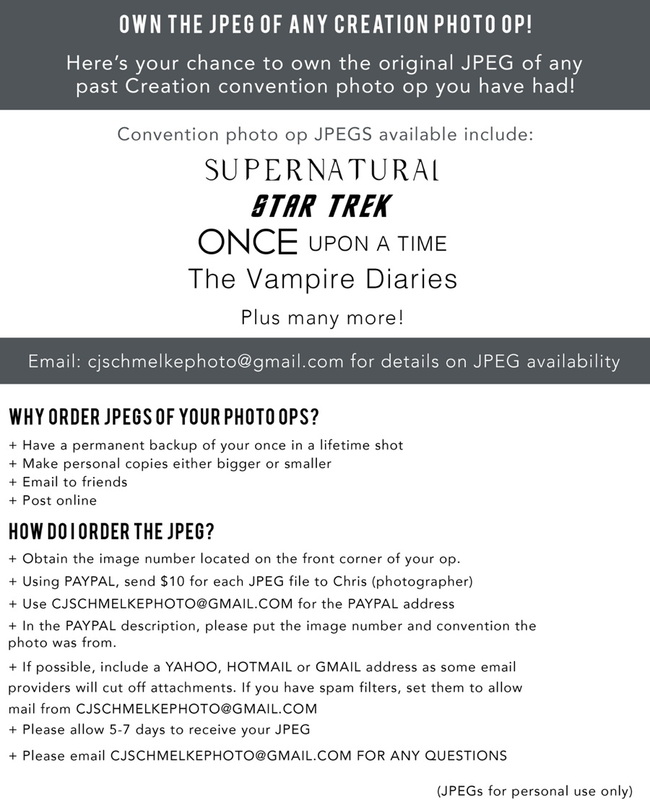 Photo Op Tickets do not include admission to the convention. You must have a ticket for the convention to enter into the photo op areas. Due to security considerations and guest concerns we cannot facilitate the giving of gifts to guests at the photo op sessions. WE WILL BE DOING AT THE CONVENTION. This is more to relay which will be available, times will be firmed up by showtime and final times announced there. HAVE FUN! NOTE: Up to 2 fans per picture allowed. Saturday's schedule is posted at the TOP of this page!